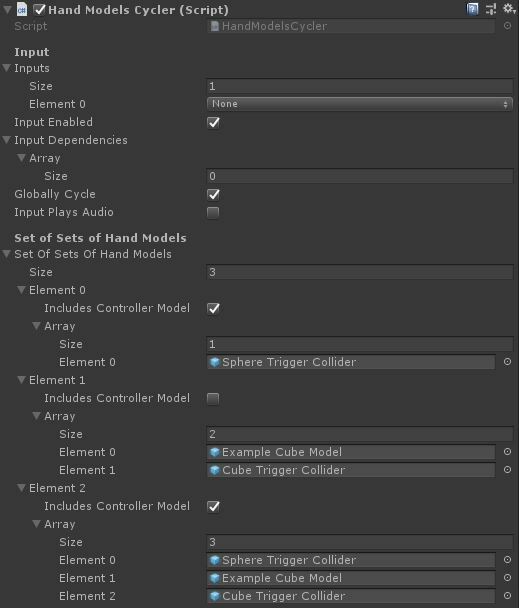 Swap between sets of models to use for hands of the player, upon input or via script. Cycling hand models is especially useful in parallel with Locomotions Cycling, when you want to have a different hand model for each locomotion or combination of locomotions. You can create the models you want to cycle between and put them as children of the cycler. Then hook up references to those children objects in the cycler's inspector. You may provide nontrigger colliders, trigger colliders, or both. Note that the player object already has the necessary rigidbody. You also have the option to display the default controller model along with each combination of custom hand models.